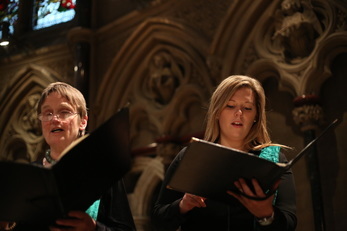 Founded in 1986, we are a choir of 35 singers, drawn from a wide range of backgrounds. Membership is by audition every three years. Led by our director, cellist and conductor Graham Walker, we offer five varied programmes a year, which we generally perform both in a historic Cambridge venue, and again in one of the surrounding towns or villages. In addition, we often travel further afield and have given several concerts in London in recent years. Our last overseas trip was to Dresden in April 2016. Although the majority of music we sing is a cappella or accompanied by piano or organ, we regularly perform with orchestras, and we are thrilled to be working with the Sinfonia of Cambridge as well as the Cambridge Baroque Camerata this coming season. As a choir that relishes imaginative pairings, our 2018-19 season is filled with unusual and inspiring juxtapositions: old and new, familiar classics and hidden gems. We begin our season on a reflective mode, marking the 100th anniversary of the Armistice with Durufle's Requiem and other compositions which use plainsong chants as their inspiration. Our Christmas concerts pair Benjamin Britten's classic A Ceremony of Carols with a semi-staged performance of Menotti's lesser known one-act opera Amahl and the Night Visitors. In January 2019, two years on from our last hugely successful BIG SING, we will again be inviting singers from all over East Anglia to join us for Gabriel Faure's familiar and well-loved Requiem. Proceeds from this popular event will go towards supporting our Charity Partner, CPSL Mind, who provide much valued support and services in the Cambridge and Peterborough area, for people experiencing mental health challenges. For our Lenten concert, we offer J.S. Bach's epic Mass in B Minor, finished in the last year of his life, in the Victorian Gothic splendour of St John's College Chapel, Cambridge. For our final concerts of the season, we turn to two other 'last works' - Parry's six Songs of Farewell and Victoria's Requiem. The movements of the two works are interspersed to provide a unique listening experience. This season, we are making our first visits to the town of Littleport and the village of Guilden Morden, along with a return to the village of Fulbourn, making it easier for you to enjoy beautiful music in beautiful settings. We look forward to welcoming you to our concerts. Members of the public can help us make new music by contributing to our New Music Fund or by buying shares in specific new commissions through our New Cambridge Songs Scheme.